Q) What are the 3 main benefits of a TiltPlate? A) Number one is safety. 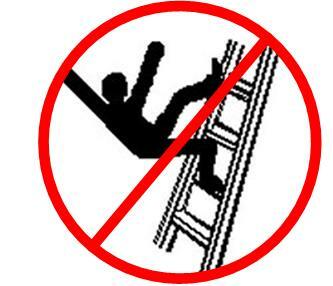 No more climbing a 16 foot ladder to reach any part of your antenna or tower. Number two is convenience. You can single handedly lower your antenna from it's normal operating position to ground level for maintenance in a matter of minutes. Whether you have a simple aluminum yagi or a high tech antenna like the SteppIR, it is nice to work on it from the ground. Number three is protection in a storm. If you know you will have high winds (e.g. a hurricane warning), you can lay your tower and antenna down at ground level and tie it off. Q) What were the design considerations for the TiltPlates? A) The design focuses on strength, quality, and durability while still using light weight materials when appropriate. All of the hardware is stainless steel to withstand years of exposure to the elements. The bearings (click) are rated for the harsh environment. The TiltPlates use high quality U-bolts from DX Engineering. The plates are 6061 aluminum and machined on a CNC for dimensional accuracy. The TiltPlate is designed to protect your antenna investment and provide convenience and safety for you. Q) How strong is the TiltPlate? A) Joe / WD0M recently lost his tower in a mircoburst. Click here to see some pictures of the aftermath and Joe's comments. Q) The TiltPlate is pretty expensive. Why is that? A) The major costs are for raw material (aluminum plate), machining, top quality components, and labor. 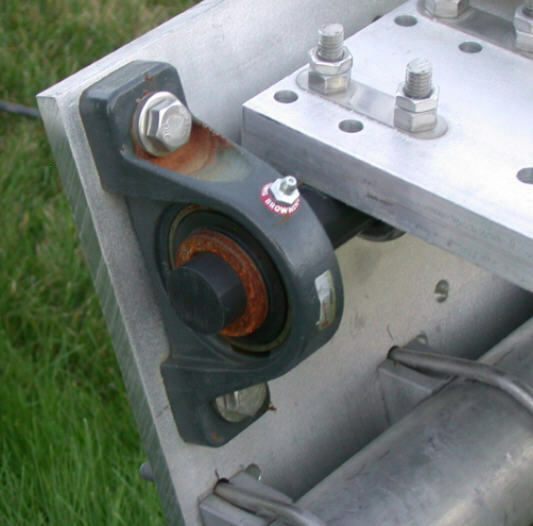 When you consider a tower and antenna can cost $10,000 or more, the safety and convenience of a TiltPlate is put into perspective. Q) Can I really lower my tower to the ground for maintenance in just a few minutes? A) If you have a crankup / tiltover tower, there is one winch for each function. You can motorize both winches if desired. And with the TiltPlate you can really be working on your antenna in a matter of minutes. Here is a link to my MA-850, you can see more pictures on my "antennas and towers" web page. Note, U.S. Towers is no longer selling their raising fixtures with the MD-75 motor but you can still buy the MD-75 and install it yourself. Q) What type of tilt over towers can I use? A) The TiltPlate will work with any tiltover tower that pivots near ground level or has a pivot point up to about 5 feet off of the ground. If your tower pivot point is higher than 5 feet it may still work if it can tilt beyond horizontal. See next FAQ. 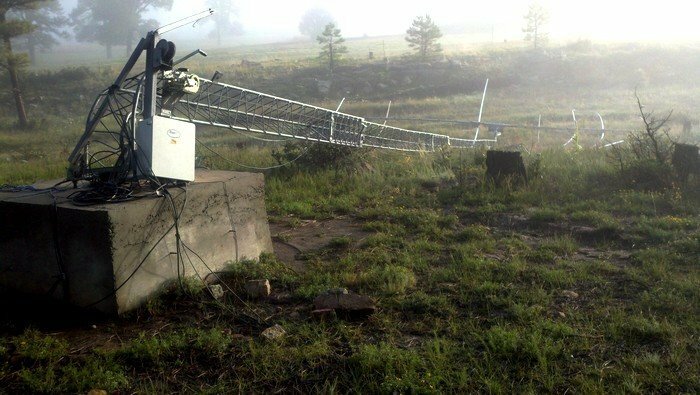 Q) How would it work if my tower pivots at 20 feet? A) The TiltPlate must open beyond the normal maximum of 110 degrees for the STANDARD model and 90 degrees for the MONSTER model. There is a "no cost" option to allow the plates to open to about 140 - 160 degrees. Click here for more information. Q) What models and options are most popular? 20% Send in pictures of their installation to share on the web page. We encourage everyone to send them along with tips and comments. Your pictures could help someone that has a similiar antenna or tower setup. Q) Which model is right for me? A) The main considerations are the weight and wind load of your antenna. 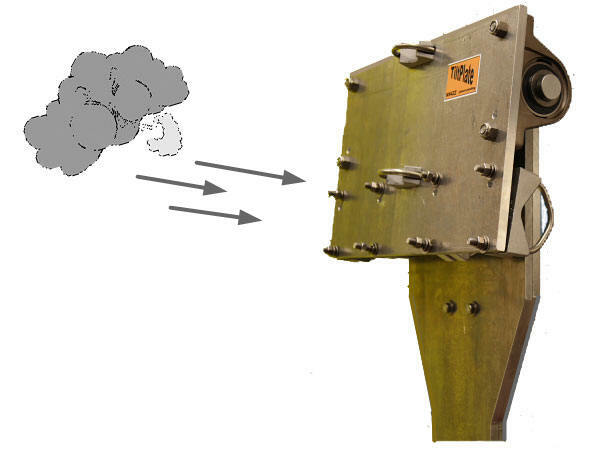 For smaller antennas, the space available between the elements where the boom/mast plate mounts is a consideration. The Mini-TiltPlate may be a better fit for the smaller antennas since it only requires 12 inches for mounting. 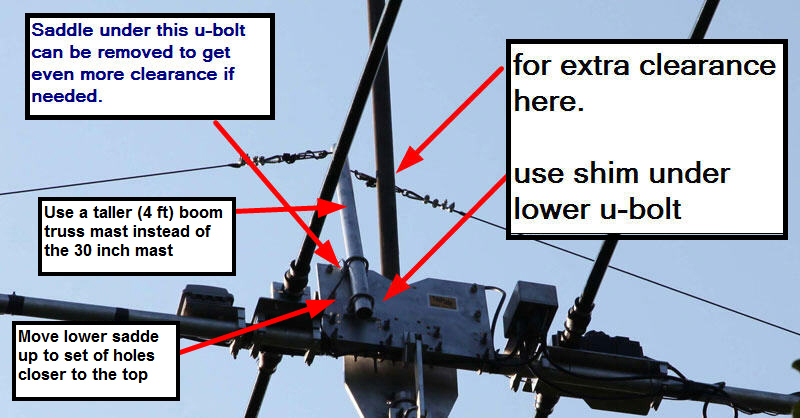 You may also want to consider whether you plan to change antennas in the future since the boom u-bolts can be changed to support different antennas. Click to go to the specifications page for more information. The 3 el Steppir will work on either the Mini-TiltPlate or the Standard model. See pix below. If you plan to upgrade antennas at some point, the Standard model could be a better choice. If not, the Mini-TiltPlate will work fine and is less expensive. The Mini is also 5 lbs lighter than the Standard model and has 0.2 sq ft less wind load whcih may be a consideration for smaller towers. Also note that the Mini model does not support a boom truss which is not an issue for the 3 el unless you are considering the cosmetic loop droop truss option. On a related note, SteppIR offers a "high wind kit" for the 3el SteppIR that is not needed with a TiltPlate. Q) How do I install the TiltPlate? A) Click here for the basic installation instructions. There are also additional notes in the "Operation and Options" section below for some specific antennas. Q) Leveling the elements -- How do I compensate for the plate offset and insure the antenna will be level? A) The boom is rotated to compensate for the offset. Click here to read about several methods you can use to get the right offset. 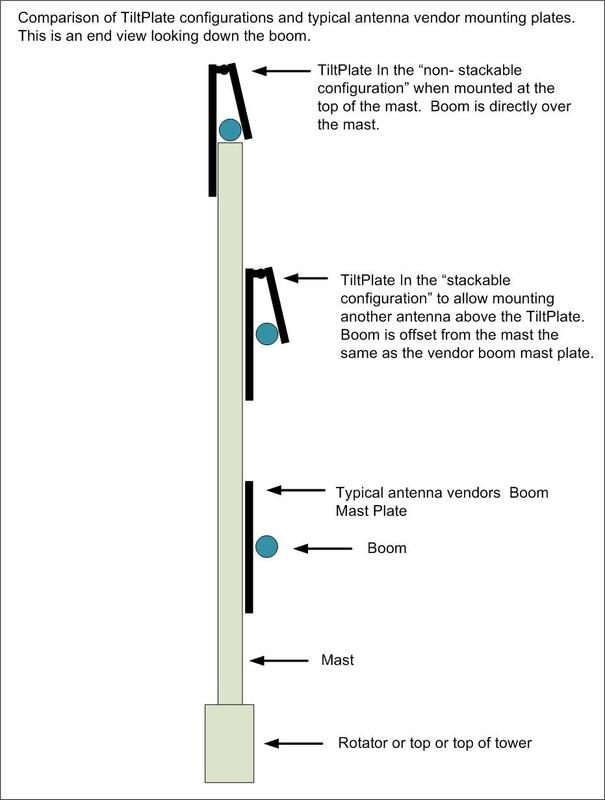 Q) How is boom located relative to the mast with a TiltPlate? 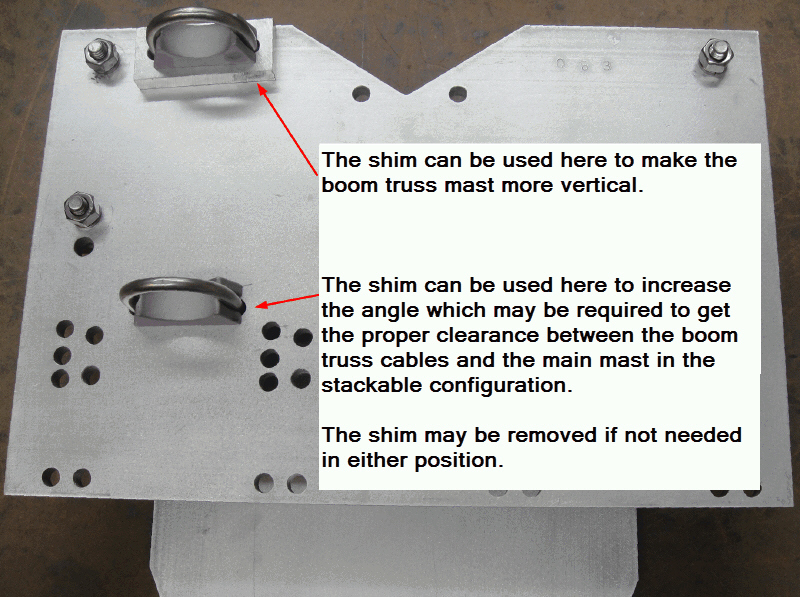 A) The boom relative to the mast is the same as the typical vendors boom mast plate in the "stackable configuration." In the non-stackable configuration it is actually centered over the mast. Q) What are the dimensions of the TiltPlate? Q) The TiltPlate is wider than my original boom/mast plate and on my application the boom mounting location is a little off center. The antenna is not completely balanced end to end. Should I try to compensate? A) In most cases it is not a problem. If you want to adjust the balance, here are some options to consider. You can make a sliding weight from a piece of steel bar or other item from the junk box and a u-bolt. You can insert a short section of water pipe at the "light end" of the boom. You can also nest a smaller section of water pipe to get extra weight if needed. 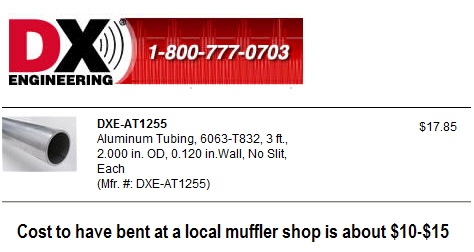 It's an inexpensive option and is not visible once installed. It doesn't take much weight (3-5 lbs) when it is 10-15 feet from the center to provide the necessary balance. Q) Is any regular maintenance required. A) The bearings have a grease fitting but only require greasing every 5 years or so to keep the moisture out. Any type of automotive grease is fine. Although the bearing block is nickel plated it will develop surface rust. This won't affect the functionality but you can paint the bearing races if desired or use a "rust inhibitor" like LPS 3. 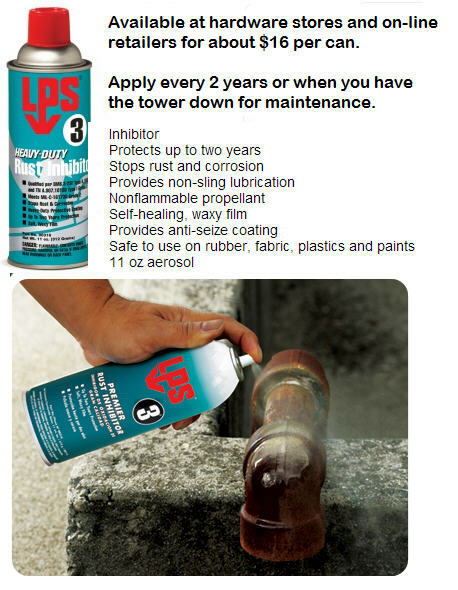 Click here for more information on LPS3. Painting or the the rust inhibitor is not required and purely cosmetic. 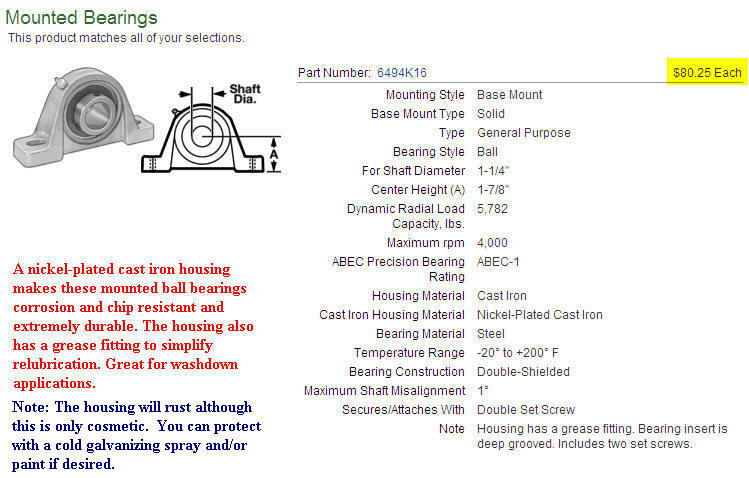 Click here for the bearing specs. Click here to see an an example of what the surface rust will look like. All of the stainless fitting are assembled with Never-Seez to allow easy disassembly should it ever be required. No other maintenance is required. DX Engineering carries this product for about $15. Q) Can you provide installation service or do you recommend anyone? Q) Will the antenna stay perfectly level as the tower tilts? A) As the tower tilts over the antenna will not stay perfectly level. However as it gets close to the ground you can easily swivel it as needed. Some folks rest the antenna on a saw horse or use a bungee cord to hold it in place for maintenance. Q) It seems like there should be a latch or lock to keep the antenna from moving. Is a lock needed? A) No, the weight of the antenna exerts enough force needed to keep the antenna in place. 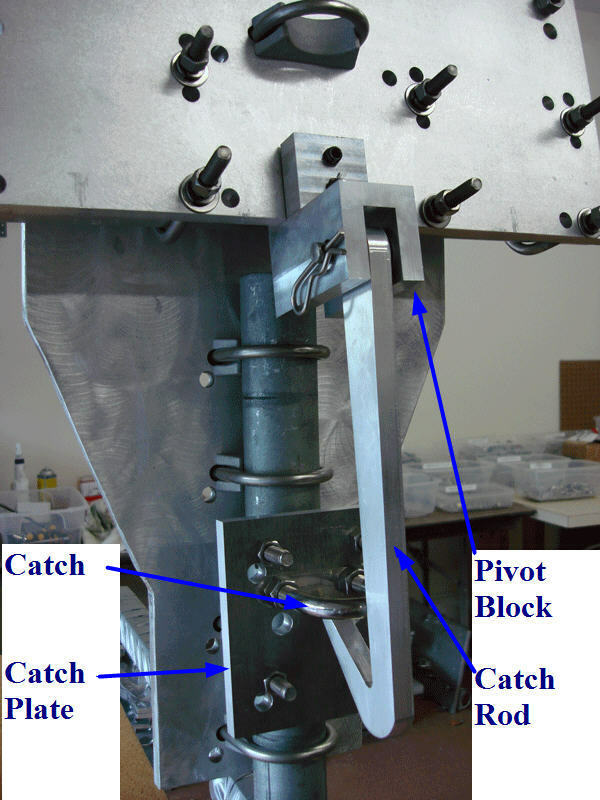 The tilting plate is intentionally held a few degrees (6-12 depending on boom size) off vertical by the boom u-bolts to generate the down force. Q) What happens when the wind really blows? A) In high winds (30-40 mph) the antenna will tilt up and return to the normal position as the wind subsides. It won't lift unless the wind is from the right direction (from behind). The wind actually forces the plates together when it is from the front side (diagram). This tilting is normal and working as designed. 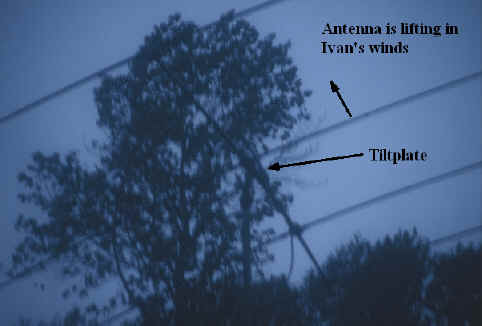 During Hurricane Ivan my 4el yagi tilted up about 30 degrees a few times in the 40+ MPH winds. Gusts of 50+ MPH were recorded in other storms, again with no ill effects. In very high winds the antenna can go almost vertical. Click here for a video sent in by John / KO4XJ showing his 4 el SteppIR without a KARLock tilting in a storm. 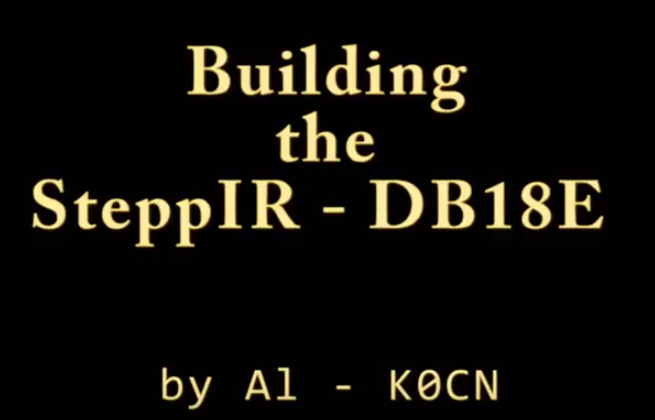 Click here for a video showing a DB18 in a storm without the KARLock. Provided by Kim / K4ATX. Kim estimated the gusts at about 30 MPH. The videos are also available on the NN4ZZ YouTube channel. Q) I live in a very windy area and would feel better if I could lock the TiltPlate to avoid the lifting. Is there any provision for that? A) The KARLock is an optional lock you can add to your TiltPlate to prevent lifting in heavy wind. The lock only engages in high wind conditions and only when the tower is in the operational position. You don't have to climb the tower or remove screws, etc to tilt your tower. CLICK here or on the picture below for more information. Q) I'm not sure if I want a KARLock, can I wait and install it later? A) Yes, it can be installed later. However, it is easier to install and adjust from the start when the boom is first attached to the TiltPlate. When retrofitting a KARLock , there are 2 installation options. 1) Tilt the tower, remove the antenna (or just the element tubes for a SteppIR) and install the KARLock per the instructions. 2) Install the KARLock with the tower in the vertical postion. The antenna does not need to be removed with this method but it does require climbing a ladder. If you order the KARLock and TiltPlate at the same time, the location of the "catch plate" will be marked for the proper adjustment based on your boom diameter. Q) Is there any problem with the TiltPlate/antenna slipping on the mast. 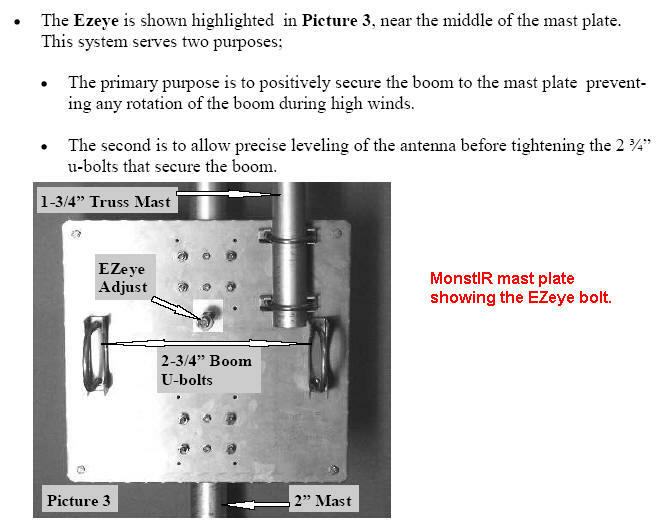 A) The Standard and Monster model TiltPlates use 4 U-bolts from DX Engineering to secure the plate to the mast, they should not slip in even the heaviest wind. If you ever have a problem you can pin the mast to the aluminum plate but again this is not needed or recommended. The Mini-TiltPlate uses 3 u-bolts but for the smaller antennas this is more than adequate. The Mini-TiltPlate is drilled for a 4th mast u-bolt should you want to add one. Q) Is there any problem with the antenna boom slipping where it mounts to the TiltPlate?. A) The Standard and Monster model TiltPlates use 4 U-bolts (or V bolts for the MonstIR) from DX Engineering to secure the boom to the movable plate. The Mini-TiltPlate uses 3 u-bolts for the boom but for the smaller antennas this is more than adequate. Q) Is there a torque specification for the U-bolts? 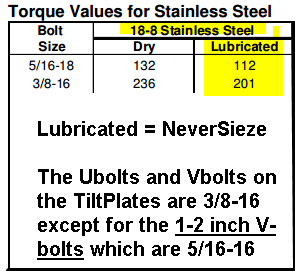 A) Most people just tighten them snuggly but here is a table listing the recommended torque. CLICK for more information on the DX Engineering support page. Also here is some additional mechanical data. Note, we ship all hardware with Never-Seez applied. Q) What types of antennas can be used with a TiltPlate? A) The TiltPlate works with any yagi or log periodic type antenna as long as there is room between the elements to attach the boom to the TiltPlate boom plate. The boom plate is 18 inches wide on the Standard and Monster models and 12" wide on the Mini-TiltPlate. The TiltPlate supports round boom sizes from 1 inch to 3 inches. Four (4) u-bolts are used on the Standard and Monster models. The Mini-TiltPlate for smaller antennas uses 3 u-bolts. - SteppIR 2el - the Standard model TiltPlate is mounted between the tubes instead of in the factory boom plate position. See the customer pictures for the W2CEA installation on the customer pics page. This antenna is also a good fit on the Mini-TiltPlate. - SteppIR 4el If you have the optional 30/40 loop, click for an important note. Paul / W0PL provided some installation tips that might be helpful to others who are assembling a DB18E on a TiltPlate. CLICK here for more excellent pictures and video by Max NG7M. EZeye bolt -- some SteppIR models have an EZeye bolt. The EZeye (click for picture) is NOT needed with the TiltPlate. The EZeye is a SteppIR product intended to provide additional resistance against slippage of the boom. The TiltPlate uses 4 V-bolts instead of the 2 u-bolts that are supplied with the SteppIR Mast plate. So the EZeye is not required or recommended. There have been no reports of slippage on the TiltPlate without the EZeye. - M2 40M4LLDD -- Click for special instructions and parts needed. - Click here for a link with tips and pictures for installing the Mosley PRO 67. They include tips on leveling and the phasing tube routing. 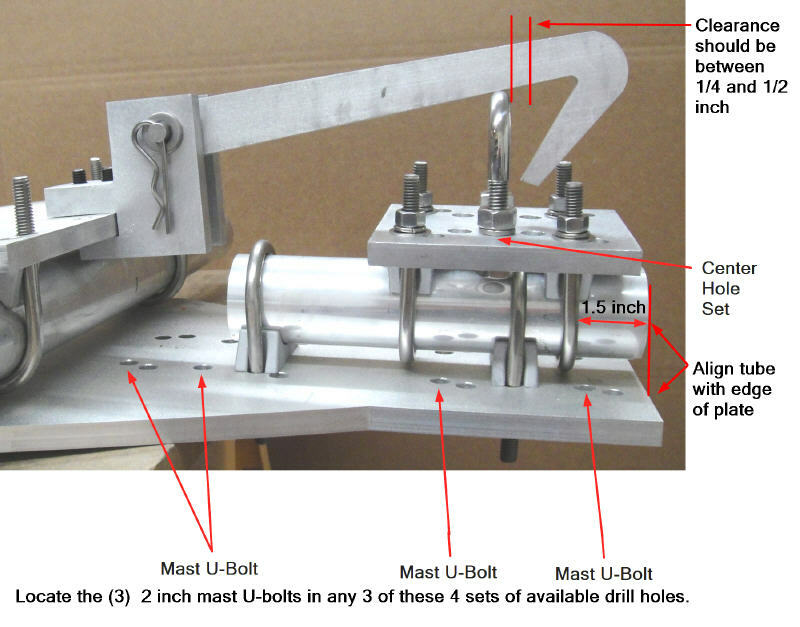 Q) What U-bolts are used for the round booms? 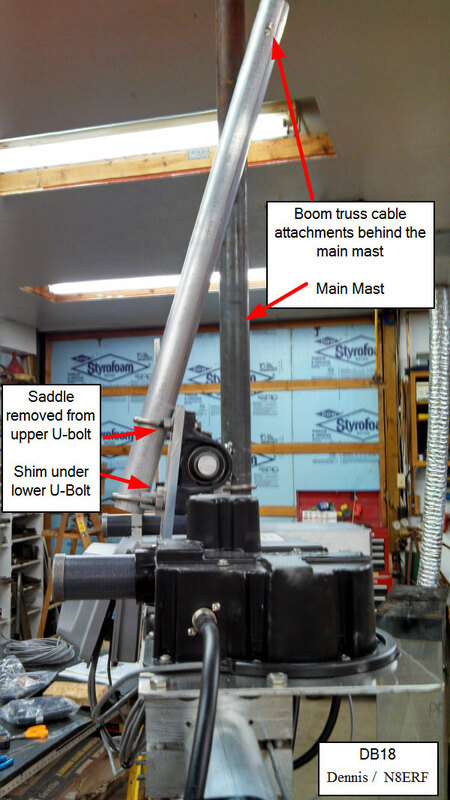 Q) Can I order a standard model with the 2 - 3 inch boom V-bolt clamps or the 3 inch U-Bolts? I have an antenna that is light enough for the standard model but has a boom larger than 2 1/2 inches. A) All clamping options are available on all models. The fixed sized U-bolts are the preferred choice but either U-bolts or the V-bolts will work. The 3 inch U-bolts support up to a 3 nch boom but the the 2 - 3 inch V-bolts only support booms up to 2 3/4 inches due to the thickness of the plates. These V-bolts are listed on the DX Engineering site as supporting up to a 3 inch boom but that is not the case with the TiltPlate. Q) Will the TiltPlate work with a "hexbeam" type antenna? A) No, the TiltPlate won't but we have a device called the HexLock that will support this type of antenna. Click here or on the HexLock logo below for more information. Q) Will the TiltPlate work with a Quad antenna? A) No, the TiltPlate won't but we have a device available that will. The QuadLock will swivel the loops and allow you to tilt the tower to the ground for maintenance. Click here or on the QuadLock logo for more information. A) The boom truss mast is optional, check your antenna manual to see if one is needed. The purpose of the boom truss mast is to provide an attachment point for the boom truss cables if your antenna requires one. The boom truss clamps provided are 2 inch U-bolts from DX Engineering. The actual mast section is typically provided by the antenna vendor. The length is usually about 3 feet Check your antenna manual to see where they recommend attaching the cables. For example, on the SteppIR 4el yagi the attachment point is between 26 and 30 inches above the boom so a 36 inch mast is more than adequate. DX Engineering is a good source for tubing. Q) Since the moveable plate is held out a few degrees, the boom truss mast is not perfectly vertical, is that a problem? A) The boom truss cable attachment point may be a few inches off center ( i.e not directly above the boom). The offset is required on the "stackable" TiltPlates to provide the proper clearance for the boom truss cables so they don't interfere with the mast that extends above the TiltPlate. The shim block can be used under the bottom u-bolt to get more clearance in this case. The shim block can also be used under the top u-bolt if you would like to reduce the amount of offset and make the truss mast more vertical. This would be useful for the larger diameter booms and also when using the TiltPlate in the non-stackable configuration.. The 1/2 inch thick shim block is included with the TiltPlates. If you need one of the shim blocks, it's available for $3 (block is free, just pay for S&H). Click here for a picture of the block. You can get additional adjustment if needed by using an angled boom truss mast. You can make your own or I sell one already bent. Prices on the main page. 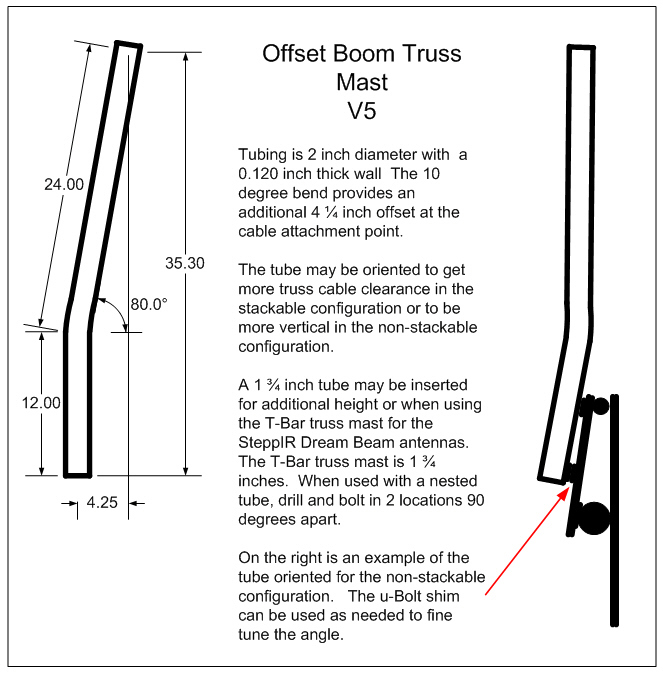 Q) The boom truss cables on the SteppIR DB18 need additional clearance when using the STACKABLE TiltPlate configuration. What are the options? A) The boom truss mast on the DB18 is shorter than some of the other SteppIR antennas so the truss cables will interfere with the main mast unless you use the options below. There are other antennas where the boom truss may also need some additional clearance. Stackable Boom Truss - Here are some ways to get more truss cable clearance if needed. You can use one or several of these methods in combination. move the lower u-bolt up to a set of holes closer to the top. The newer plates have several sets of holes for mounting the lower u-bolt. use a mast that has a slight bend (see PREVIOUS FAQ). 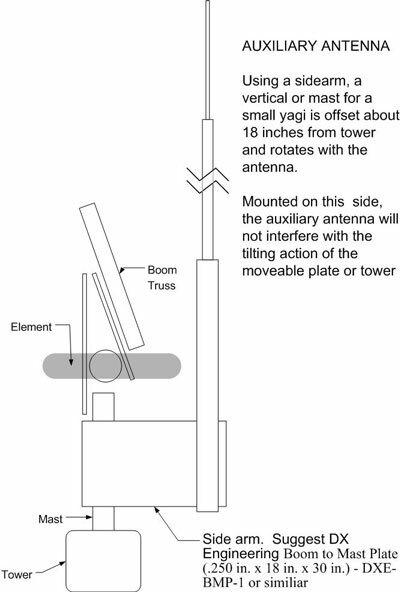 Warning -- if you pull the boom backward too far behind the main mast it can cause the antenna to lift and engage the KARLock when tilting over the tower. One way to avoid the problem is to use a lateral strut although this is not normally needed except on the larger SteppIR antennas. Click here for more information on the lateral strut options. Q) I have the "stackable" TiltPlate model. Can I just attach the truss cables to the mast that extends beyond the top of the TiltPlate? A) It will work but is not the recommended setup. The boom truss mast is attached to the moveable boom plate to keep the cable tension on the boom constant as the tower is tilted over. Connecting the cable to the main mast will work but the tension will change as the tower is tilted allowing the boom to droop more. It will be harder to set the cables up for the proper boom support. Q) I don't need a boom truss on my antenna but I have one of the SteppIR antennas with the trombone element in the center. There is an optional truss bracket supplied by SteppIR to give the trombone some extra support. Can I use the TiltPlate boom truss mast for this? A) Yes, you can attach the trombone truss cable to the boom truss mast. You may also be able to use the aluminum bracket supplied by SteppIR if there is room to mount it next to the TiltPlate. And another option is to attach the SteppIR bracket directly to the TiltPlate using some of the extra holes next to one of the boom u-bolts. Q) Can I put a second antenna above the TiltPlate on the boom truss mast? A) The "boom truss" mast attaches to the movable plate and can be up to 4 feet long. You can mount a small antenna (e.g. 2M yagi, ground plane) to the mast. An aluminum mast is recommended to keep the weight down. 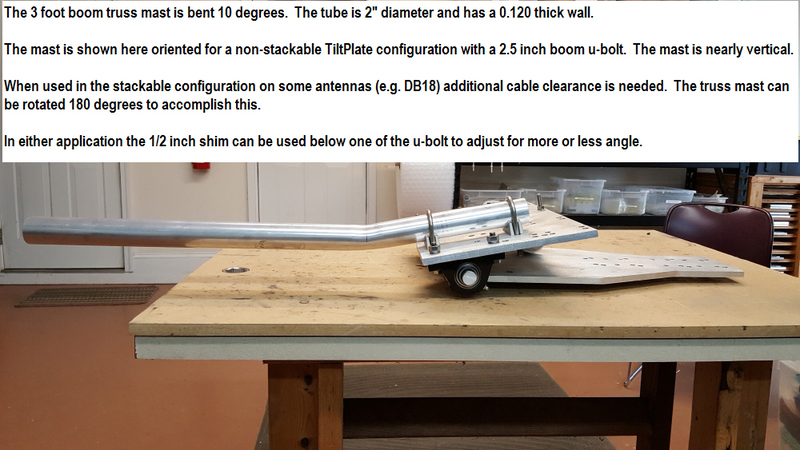 The total weight of the antenna and mast should not exceed 10 lbs. Both the weight and antenna height are factors since they counteract the effect of the main antenna. 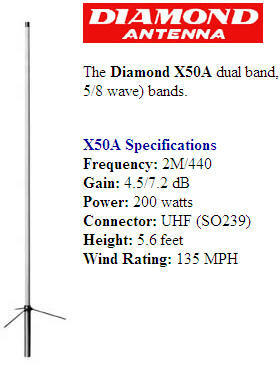 A light weight ground plane such as the Diamond X50A (click for pix) is recommended. It weights about 2.5 pounds and is 5.6 feet tall. The height from the boom to the tip of the ground plane antenna should not be more than 9 feet. See the customer picture submitted by KB5XE for an example. The STACKABLE configuration is the best option if you want to add an antenna above the TiltPlate. Q) Can I mount an antenna along side the TiltPlate? I have a larger vertical for 2M that is about 17 feet tall? A) You may be able to mount a taller vertical (for example the Ringo Ranger AR 10) along side your TiltPlate using a sidearm. Here is a diagram to illustrate. You can also use this method to mount a small 2M yagi above the TiltPlate. 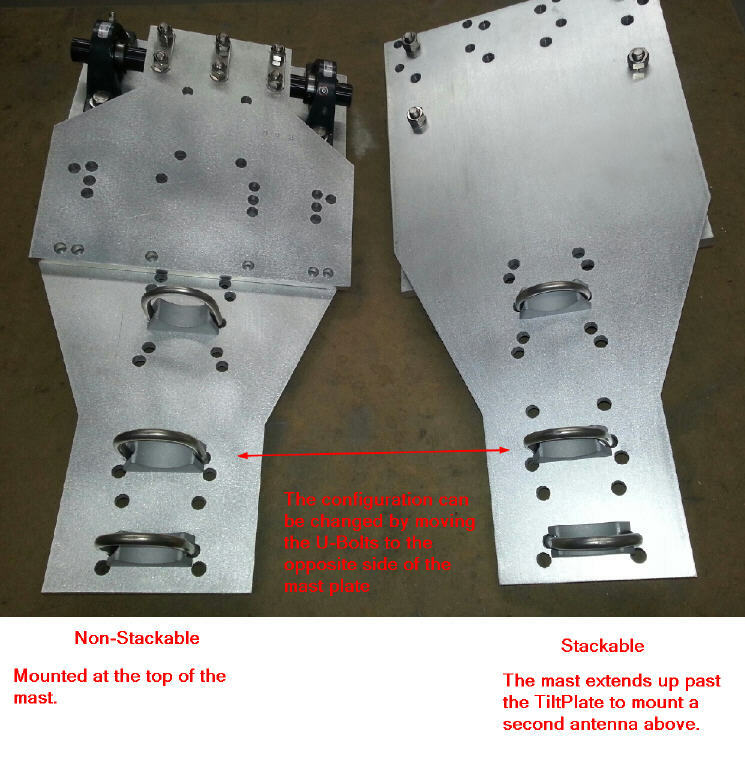 See the FAQ below on STACKABLE TiltPlates configuration, this is the best option if you want to add a second antenna above the TiltPlate. Q) Can I mount another antenna below the TiltPlate? A) You can mount a 30M or 40M rotatable dipole on the mast below the TiltPlate and yagi. The booms should be parallel so as not to interfere in the tilting action of the TiltPlate. Some have reported that when the dipole is below their yagi the swr of the dipole is affected. They report good results when mounting the dipole above the yagi. 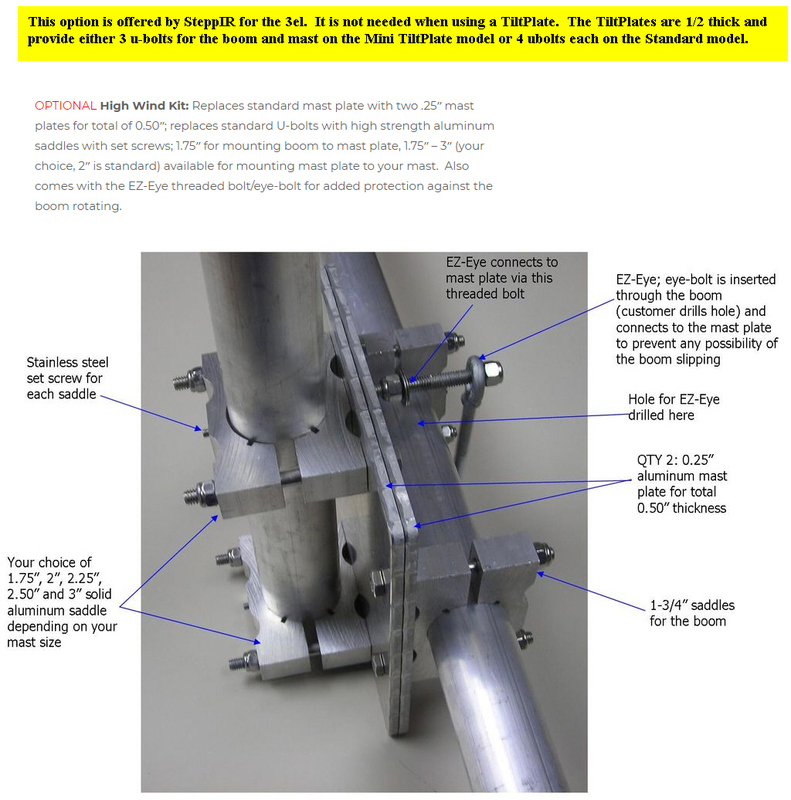 The stackable option below will allow you to mount the dipole above or below. Q) Can I stack two TiltPlates on one mast or allow the mast to extend above the TiltPlate for a second antenna. A) The standard non-stackable configuration is designed to mount the TiltPlate as the last (or top) attachment on the mast. The STACKABLE configuration allows the mast to extend above the TiltPlate so you can mount a second TiltPlate, rotatable dipole, or large vertical above it. Here is a link to the STACKABLE TiltPlate configuration for more information. This is the best option if you want to add a second antenna above the TiltPlate. Q) When should I order the NON-Stackable configuration? A) The non-stackable configuration is preferred when the TiltPlate will be at the top of the mast. This configuration centers the weight over the mast better. The stackable configuration is slightly off center but when a second antenna is mounted on the mast above the TiltPlate, it can be mounted to the opposite side and compensate to some degree. However, the stackable configuration can be used with or without anything above it as the difference is minimal. Q) Can I change the configuration later? A) Changing between the two options is easy to do later. The pictures below show the mini-Tiltplate but the process is the same for the other models. If you use the optional KARLock and switch from non-Stackable to stackable you will also need to add 2 additional U-bolts and the mounting tube. The second picture shows the KARLock in stackable configuration with the mounting tube. Q) Can you recommend a source for a good mast to mount a second antenna or stack multiple TiltPlates? Q) What do I need to consider before placing my order? Boom diameter - this depends on your antenna, see antenna specs or if your antenna is not listed above, check your manual. I may be able to help if you have questions on a specific antenna. Do you need any of the other options like the "bent boom mast" or lateral strut mount. Q) What is the lead time to get a TiltPlate built? A) I keep the components for all models in stock and will usually assemble and ship your TiltPlate within one week of receiving your order. Delivery is between 3-5 days. Q) How does the payment process work? Is my credit card information safe? A) The on line payment process is handled thru PayPal. You can use your credit card or PayPal account (if you have one). But you don't need to have a paypal account to use the "buy now" button. Your credit card information is NOT provided to me from PayPal. If you would prefer you can send me a check. Please eMail me for details. The on-line process is faster but either way is fine. Q) If I order a TiltPlate and KARLock at the same time, how are they shipped? A) They will be shipped in one box. Q) If I'm ordering several items or have special shipping costs, how does that work? A) The web ordering currently requires a separate transaction for each item. If you are ordering several items, the "lateral boom strut", or have international shipping you can pay me directly via PayPal in a single transaction. Contact me to determine the total cost of your order. I'll send you a PayPal invoice that you can pay with a CREDIT CARD or with your PayPal account. You do NOT need a PayPal account to use this feature but if you have one you can use it. Q) I don't have a PayPal account (and don't want one), can I still pay the invoice with my credit card? A - The PayPal screen can be confusing, click here for a "step by step" to pay using your credit card and WITHOUT a PayPal account. Q) How will my TiltPlate be shipped? A) The TiltPlates are securely bubble wrapped, boxed and shipped via UPS domestically. You will receive an email with your tracking number and can expect delivery in 3-5 days in the lower 48 states. The domestic packaging and shipping costs are listed on the main page. We also ship to Alaska, Hawaii, and Canada, but the rates are slightly higher. Please email me for the rates to your location. See below for international shipping. Q) What about International shipping? A) International shipping rates vary considerably. The rate to Europe can vary between $175 to $350. The rates to the middle east or Australia for example can be up to $500. Generally USPS Priority mail is less expensive to Europe and other countries. Please email me for the rates to your location. A proforma invoice will be provided to help with customs pickup. Please be sure to include your PHONE NUMBER when ordering as this is needed for the CP-72 USPS customs form. Q) What if I live in the Atlanta area or want to pick it up instead of having it shipped? A) No problem, I'll refund the shipping and packaging cost when you pick it up. Q) What does the TiltPlate patent cover? A) The patent covers the TiltPlate and KARLock. Click on the picture below for the full patent detail. Q) What if I want to build my own TiltPlate? A) All of the information on the how to build one of the early models is posted. It will cost about $600 for parts. Click Here for more information. If you have any questions I'm happy to answer them. Most folks find that my "for sale" models are really a bargain when you consider the labor, quality, upgraded components, and improved design.